Carroll Parrot Blue, a research professor at the University of Houston, will present the Women’s History Month keynote lecture and a workshop on Tuesday (March 9) and Wednesday (March 10). The award-winning filmmaker, author and interactive media producer will discuss “The History of the Future,” an exploration of “the inner reaches of self-reflection and personal triumph,” at 7 p.m. in College of Humanities and Social Sciences Building Room 110, according to Bernadette Pruitt, associate professor of history. “Her most recent documentary film looks at Third Ward, a super neighborhood in Houston. By chronicling Third Ward and its people, the project remembers a significant part of Houston's history,” Pruitt said. “The film specifically remembers the origins of the ward in the nineteenth century to the settlement of African Americans in the late 19th and early 20th centuries. “Even during the period of racial segregation, blacks prospered in a variety of ways, with some entering the middle-class elite while others found ways to build churches and sustain personal connections with loved ones, especially family members residing in the surrounding hinterland,” she said. Blue’s documentary reflects her own history. Her parents migrated to Houston during the Great Migration, “when blacks from across the country sought improved lifestyles outside the world of racial segregation and violence,” though she grew up in an upper middle-class family, including a father who was a Third Ward dentist and a mother who taught school and held a graduate degree in special education, Pruitt said. On Wednesday (March 10), Blue will also present a workshop on her memoir “The Dawn at My Back” at 1 p.m. in Academic Building Room 302. “Her narrative chronicles the life experiences of her mother, a professional Texas woman who felt the scorn of racism and still found ways to persevere. Her mother’s sacrifices and triumphs speak to the unending legitimacy of community building and self-help perseveration,” Pruitt said. Blue earned an undergraduate degree from Boston University and a master’s degree from the University of California, Los Angeles. 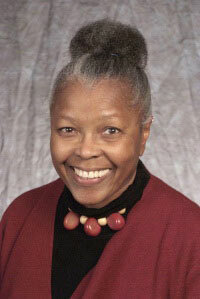 She taught at San Diego State University for 25 years, receiving the title of Professor Emeritus of Theater, Television and Film. Her documentaries have appeared on PBS’s NOVA and Smithsonian World.